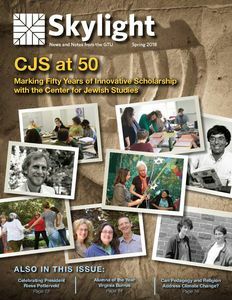 In this issue of our GTU magazine Skylight (formerly Currents), our lead feature spotlights the Center for Jewish Studies as it completes 50 years of innovative scholarship and community building. You'll also find articles from GTU faculty and students discussing the key role of teaching and religion in creating an equitable and ecological future, a loving tribute to soon-to-retire GTU President Riess Potterveld, a celebration of GTU's women scholars and its alumna of the year, and much more. Click the link below to read the Spring 2018 online edition of Skylight.